Whirligig? Rio Rattles? Congophone? New vocabulary? No, just the names given to toys one can make with the instructions given in Czernecki’s craft book, which is an invitation to children and adults to experience hand made toys with the simplest medium—cardboard. put together a book that goes beyond simple crafting. The folk art of toy making is reviewed with simple stories describing each toy. The Whirligig is a distinctive North American toy that was introduced during the fight for American Independence. Rio Rattles are used in the celebration of the Carnival of Rio de Janeiro. When one needs to communicate with others or to talk to the animals, a Congophone is used. 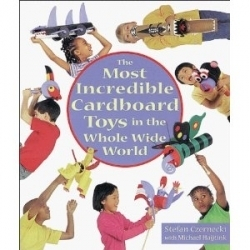 These and other toys found on all five continents are presented in this book. Art, craft, history, geography, legend and tall tale are neatly packaged around directions and colorful diagrams. General directions and tips for working with the various cardboard pieces are invaluable. There is a secret to getting two cardboard tubes to fit together in the formation of an animal’s neck: sandpaper. Glue, tracing paper and paint are examples of the materials that can be located in craft and hardware stores, or in any teacher’s closet, making these toys excellent projects for the classroom. A metric conversion table is provided so standard pieces can be located. Some parts do require use of power tools, a drill and saw, as well as a sharp craft knife. This equipment may not be as readily available and does indicate that adult supervision is necessary for some of these projects. In addition, several of the toys have many small parts that may require prior preparation by an adult or older child. Exact measurements in these cases appear to be needed as some of the toy pieces are the working mechanisms. In order to create the whirligig, for example, one needs to drill holes in several tubes as well as cut various wooden dowels to size, totaling over ten pieces. The whirligig design is based on the weathervane. It is a wind toy that spins around as the feet of the animal also spin in the opposite direction. pointing to and selecting pieces by color in the diagrams. Painting is a skill enjoyed by all and there is painting to be done with every toy prior to assembly. Once the skills and tricks are learned, the art of toy making is on its way to becoming an enjoyable experience. Making room decorations, a weekend family project, expanding on a history or geography lesson are all ideas one can utilize from this book. A new generation of crafters may carry on this tradition of hand made toys. One can always use a whirligig in the garden.